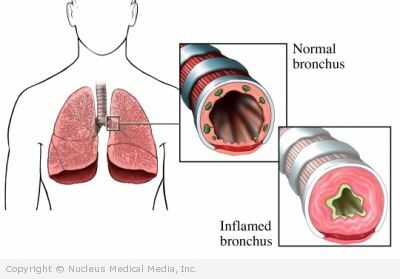 Air travels in and out of the lungs through bronchial tubes. Asthma is a chronic inflammation of these tubes. This inflammation causes airways to narrow. This makes it hard to breath. There are different degrees of asthma. Some people may have very mild asthma with rare flare-ups. Others may have a severe, constant asthma. Asthma is the most common chronic disease found in children. If your child is having trouble breathing, call 911 immediately. This is a potentially serious condition that needs immediate medical attention. If it is not an emergency, but you suspect your child may have asthma, contact your doctor. With proper treatment, asthma can be controlled. Your doctor will ask about you about your child’s symptoms and medical history. A physical exam will be done. The doctor will listen to your child’s lungs. Your doctor may refer you to a specialist. A pulmonologist focuses on the lungs. An immunologist focuses on allergies. Know what your child is allergic to and avoid known triggers. These may include certain foods, pollen, and air pollution. Avoid having your child be exposed to tobacco smoke. In addition to the medicines, children older than six months should get a yearly flu shot. Children with asthma are at a higher risk of having complications from the flu. Your child’s asthma may be triggered by allergies. In this case, your doctor may recommend allergy shots. These shots are very small amounts of an allergen injected into the skin. Over time your child will react less to the specific allergen(s). With less triggers the asthma also decreases. There are no known ways to prevent your child from developing asthma. If you child already has asthma, you can reduce your child’s risk of asthma episodes by helping him to follow the treatment plan.